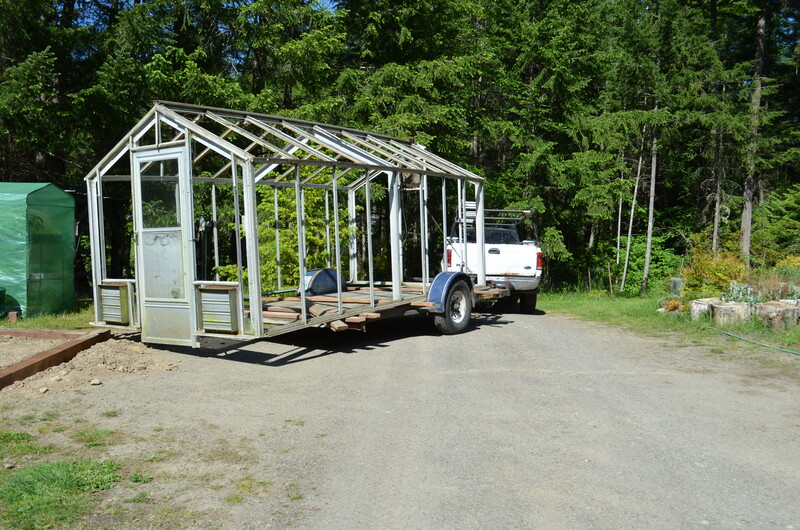 I’ll take the moving of the green house May 2013 as the time that begin my drive to firm up my finances so that I could once again support my father and I without my having to work at my tedious job. 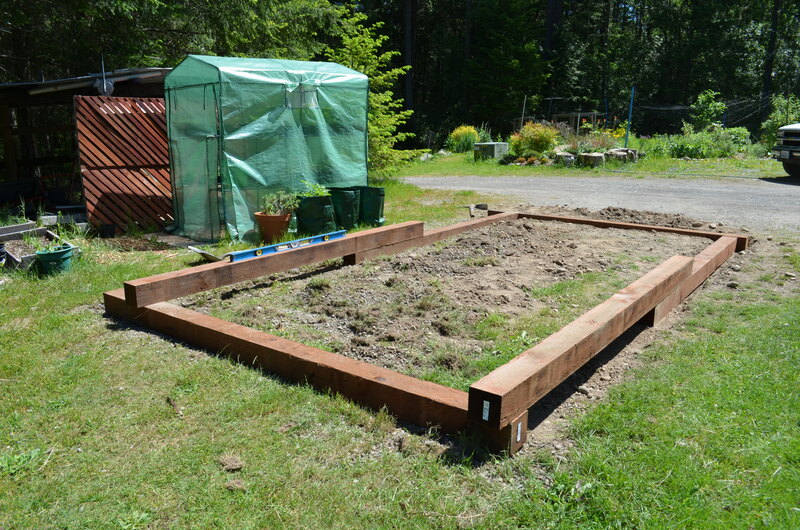 It also symbolized a new willingness to take chances and make greater efforts to find my place in life, four years to the month that I returned from California and began this blog to document my efforts to create a 10 acre garden. I finally quit my job in early September, and found a new peace with myself and my search for fulfillment that remains somehow grounded with this territory that is now mine. 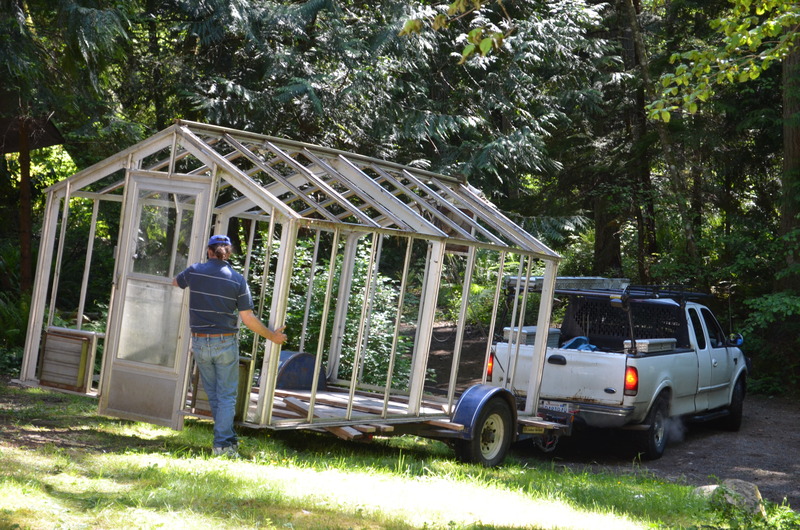 How Do You Move a Greenhouse? 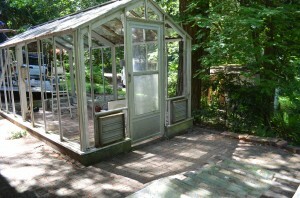 This glass monument to new beginnings was originally erected behind the main house beneath towering Douglas firs. Over the 30 + years that the thing sat there, essentially unused, the trees grew to completely shade it. 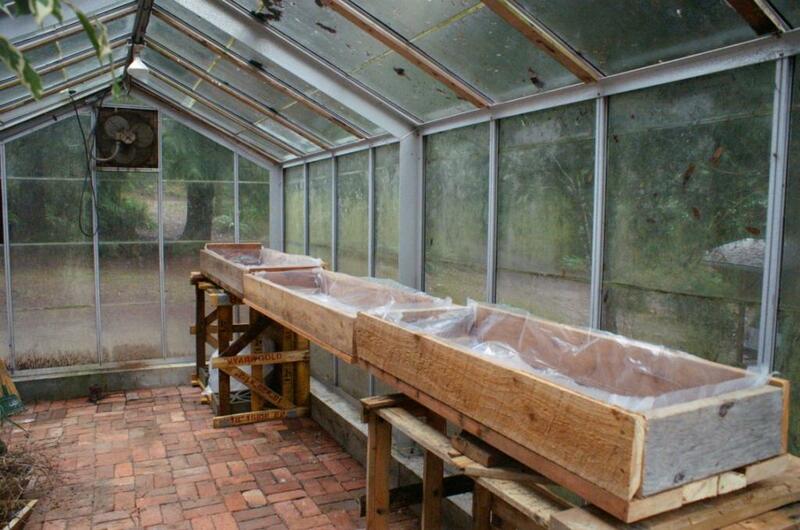 When I returned, I built planters and grew seedlings that, in the absence of enhanced light, grew tall and spindly. Basement tenants used it to store junk. 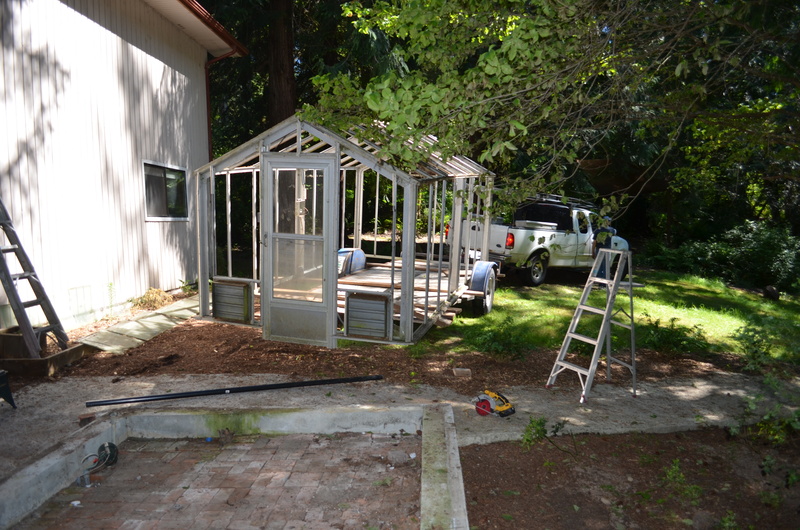 On the eve of the arrival of new tenants and my renovation of the entire house, I hired the same contractor that redid the deck to move the greenhouse. None of us knew quite what we were doing. 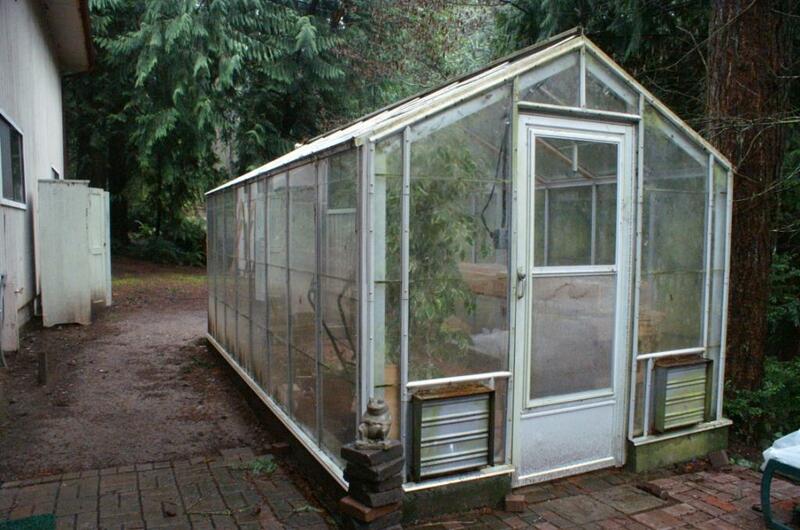 The original idea was to jack up the 10′ x 17′ structure and move it, glass and all, on a low trailer. This was later abandoned when we concurred that the twisting of the aluminum frame would shatter the glass. That, and the sheer weight of the glass would have made it unmanageable. 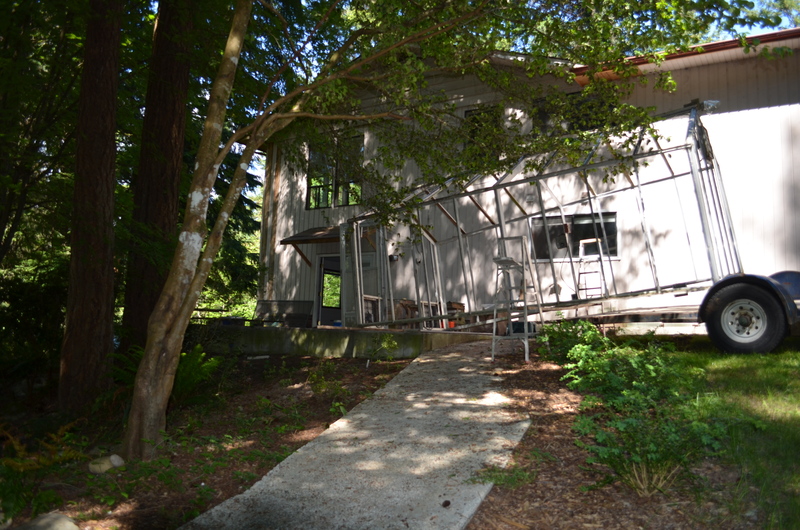 After a day spent removing glass, the contractor – a very lively 79-year-0ld – and his co-worker son used ladders and plastic pipe to alternately lift and roll the structure up onto a flatbed trailer. 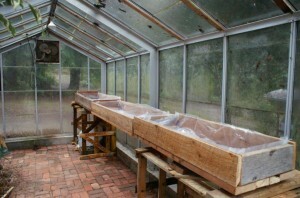 The frame tended to twist and bend, in addition to being heavier than we’d imagined. Furthermore, the wheel wells of the trailer prevented the frame from sliding all the way to the front. 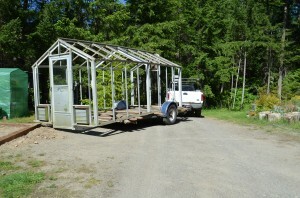 The front end of the greenhouse began to sag down to the ground, door flapping, as we descended the first hill. At the time, I had two real estate agents looking at the house. Together they, plus myself, jumped onto the tongue of the trailer while the son walked behind to hold up the end. We proceeded this way at about 3 mph over the 1,000 ft distance to the top of the hill and the sunniest place on the property. 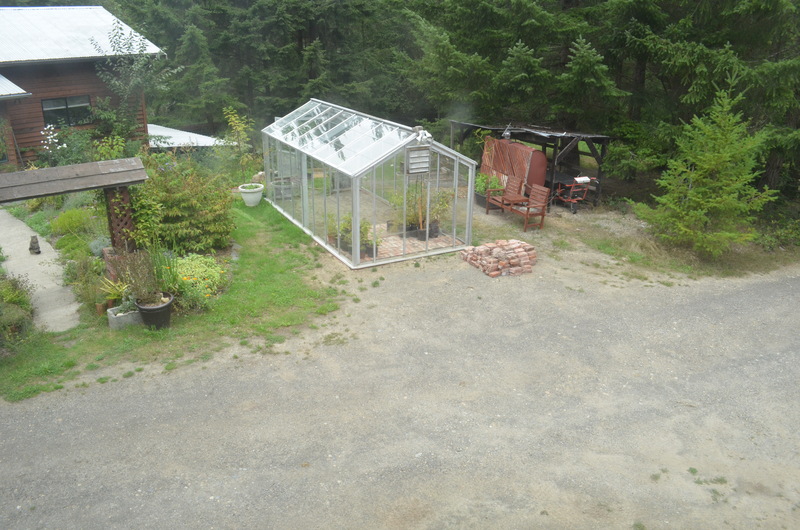 The old foundation was a brick patio with low cement walls. The new one is made of 4×4’s upon which the frame now sits. I am now in the process of installing a brick floor over sand. Most of the brick was free; the rest I had to buy at a local used materials yard for .50 each. Most of the glass survived the removal, but quite a bit of it did not survive my clumsy efforts to relocate it by wheelbarrow (you’d be amazed how much the stuff weighs – I’d say the glass alone was at least 1,000 lbs). 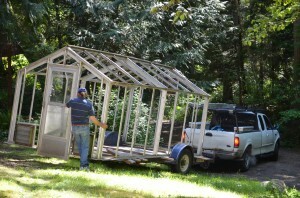 The contractor loves this greenhouse! He figured it was cheaper to move it (about $1,800 including replacement glass, 4×4’s and brick) than to buy a new one of the same quality. It appears to have been custom made, which has proven to make reconstruction slow as we hunt about for the correct size of aluminum strip to fit over the edge of each glass panel. The son started out labeling the glass panes with tape, but it turns out that all of the panels are interchangeable and have been merciful cut to even sizes with no fractions of an inch. I’ve got about 15 panels left to replace, some of which I will attempt to cut on my own. The electrical system once powered fans and a heater, but my father abandoned these long ago and they have rusted beyond repair. I’m looking into the possibility of solar fans, and a cheaper way to heat it than electricity. This is my new start at marketing landscape designs. I want to integrate the greenhouse into a larger scale design that compliments its straight, clean lines. In other words, the structure demands a level of uniformity that I’ve not yet achieved in my free-flowing, more naturalistic designs. 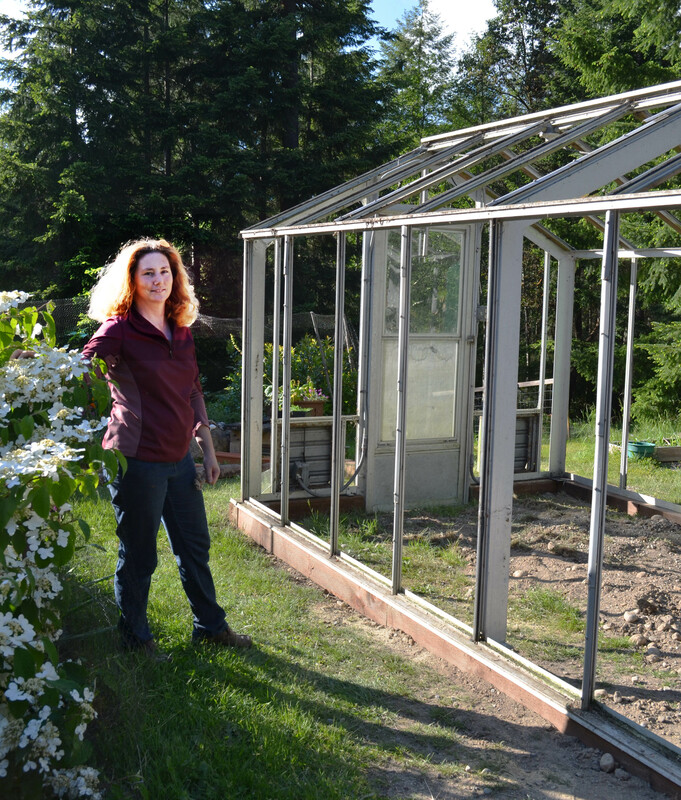 Plus I’m seeking more enduring solutions to reducing weeds, which take up much of my time to control at the moment. Considerations include cement or brick extensions along the sides that will reduce mud and weeds, and allow the placement of outside planters. 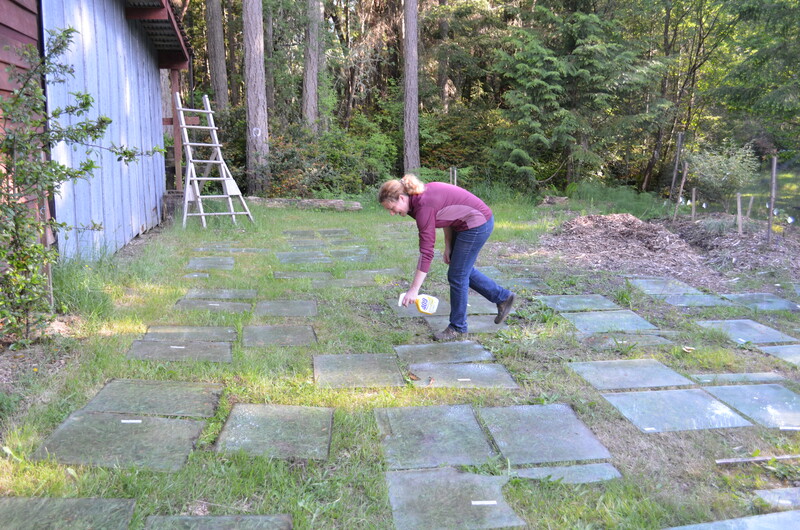 Grass strips and a more formal pathway to the barn will also create a sense of formality and organized progression from one part of the garden to the other. And the frame over the oil tank will have to go. Sorry Dad. They call it progress. Eons ago before I could remember when or why, my parents built a house on Fox Island with an associated retaining wall of basalt about five feet tall and thirty feet long. I played on it, over it, ignored it, generally, except as an impediment between the front and side yards. Mom’s creeping phlox poured over it, ferns sprouted forth from its crevices. The wall lasted for 30 years until the day last January when my father called me at my home in sunny Pasadena to tell me that the house was ‘flooded’. From where? From the outside, of course. But Dad, it’s on an island, and a small dry one at that with no rivers to be had. Wetlands, granted, and lots of them, but none near his house. He insisted that the water currently cascading down the basement steps was real, and that he had gone so far as to take his personal excavator and dig up much of the front yard next to the house to find the source. His hydrologic exploration was unsuccessful, but he was able to locate the electrical trunk line feeding the house although not before he dug. 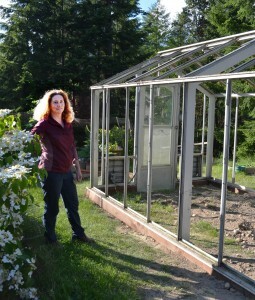 I put my head in my hands and said a silent prayer for my mother’s once beautiful garden. My preview of it in February proved the site to be nearly as bad as I had thought. The wall had been decimated, a chunk was missing from the brick trim on the house, the yard pavers had been cracked, and the place was knee deep in mud. There was no sign of grass or flowers, or any of the place’s former grandeur. By May, I had quit my job moved in for good. Hence, the beginning of my story. The front yard became my proof of point for developing a landscaping portfolio and I was going nowhere with it until that wall went back up. It was black and white thinking at its best. My first challenge, and I never saw it coming. My tendency to fix things back the way that they were so that I could sleep easy overwhelmed any thinking that may have occurred outside of the box. In two weeks, I proceeded through all of the stages of the self-created problem: acknowledgement, choosing a course of action, instant frustration at how long it is taking, seeking alternatives to achieve the goal despite cost, personal trauma (in my case physical), and feelings of hopelessness. By the first week, I had reopened an old shoulder injury and could no longer sleep for the pain. I had stood and watched my father run the excavator above and below the wall attempting to create the 2:1 grade that I had assigned him and struggling against physical exhaustion, mental fraility, and diabetes to work the giant machine for more than an hour at a time. The rocks that went into the original wall exceeding two hundred pounds in some instances and were impossible to lift into place without mechanical leverage. 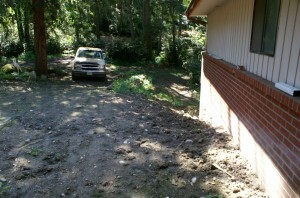 Rocks were placed, removed, dirt shifted about and compacted. I wept for the cedar tree whose roots reached out under the wall and were being torn up by the tracks. Seven days later, I was willing to call a truce. A hydraulic line had broken spilling a pool over the cedar roots. I hired a kid to move rock, but he proved less than up to the task, so I rented a bobcat. Finally, at 3 am the night before the delivery of said bobcat, I sat up in bed with pain shooting through the inflamed nerves of my hands and concluded that I was missing a critical point in all of this. Why must we use large machinery to move mountain when the very winds and waters around us can move more than we humans can ever dream to move, one grain at a time. Well, that’s the point – time. And time is money, as I was constantly reminded during my wage-earning life. But this is just time, and time that I have set aside for doing the different thing. So I may not get it done this week or even this month. This season will do. So I go out every evening and I stare at it. Soon, I have imagined it into two courses of rock, reducing the need for the structural integrity that might demand larger rocks and more demanding techniques. Still, I persist in the use of the excavator and spend a morning in a light mist with my father setting rock until his patience runs thin with yelling at me to quit moving them myself. He wants the bobcat; this is taking too long. I am losing patience with his losing patience, but more than that, I don’t want this to be dependent upon outside forces like machines with nuts, bolts, fluids that leak, tanks to be filled, and tracks that compact the earth until it is hard and barren as cement. A few cedar branches drift over where the excavator sits as I stare down at the wall. This is not about a wall, an end point. It is about the way in which I approach it. I consider my mother, who rolled rocks as large as these by herself using leverage. My father was amazed, but when you have nothing but your two hands, you find a way. The Egyptians and the Aztecs both lacked excavators. They made up for it with sheer numbers and brains. On this scale, I could possibly shun the sheer numbers but I had to use my head. This is about learning patience, and working within my own bounds. If noisy machinery and my father’s impatience took the fun out of it, then I had to find my own way to reclaim the process as my own. I’d climb down to the bottom and begin twisting and rolling a rock that exceeded my own weight at least one time over. When I considered the rock’s pivot point, and moved it around that, it was suddenly not so difficult to move it ten feet to the wall and shift it into place. A rock a day. I can do that. 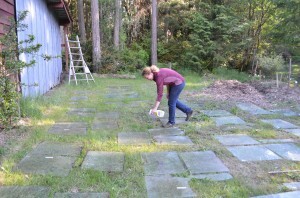 So each evening, I began slipping out after my father had gone to bed early and worked in the northern twilight literally under his second story bedroom window to set rock. I preferred to do it clandestinely to avoid argument. I considered each two-man chunk of basalt, viewing its flat sides and rounded points upon which it might pivot. I would prop them up, placing a smaller rock beneath to hold it steady until I could angle it the way that I wanted it and roll it back over. One by one, the larger stones were set. The first morning, my father commented on bringing the excavator back over to start work but I demurred. The next day, the excavator already sat in position under the tree where he’d apparently moved it while I was away. I moved three large rocks that evening, under his window. I wondered when he would notice, what he would say. After begging shamelessly for him to help me, my sudden change of direction might seem odd. That was, after all, a common complaint from my various ex partners. Internally, it made sense to me even if the rest of the world refused to acknowledge it. It didn’t matter anyway so long as I honored my own needs and let my father know honestly why I preferred to do it this way.